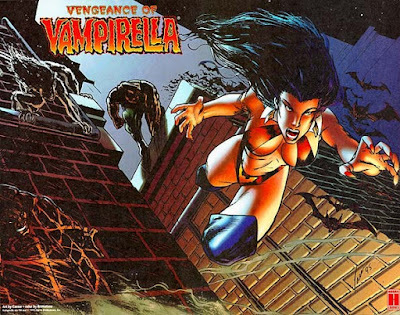 I begin as always with a picture of my favourite comic superhero - Vampirella. This piece of artwork was pencilled by Amanda Connor, an artist whose work I have always admired. You can tell this is an old picture by the Harris Comics logo in the bottom right corner. Vampi looks like she's about to cause someone some serious hurt. On the hobby front, February has been another very busy month. 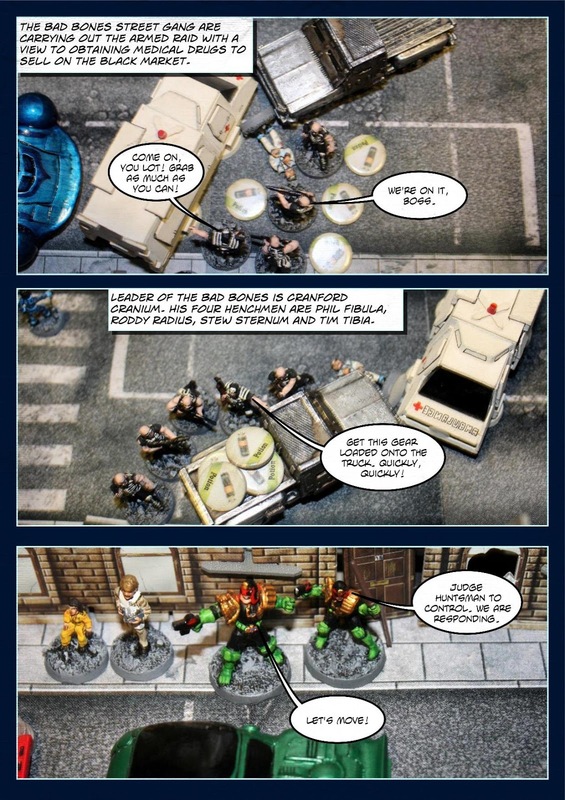 Work continues on my Judge Dredd Miniatures Game campaign with new scenery items, vehicles and figures made and painted, most of which will hopefully appear in posts during March. I'm particularly keen to show you my scratch-built Boingers. In addition to working on my JDMG stuff I have been painting a lot of contemporary 28mm scale figures - Goths by Slow Death Games, Wargames Foundry leather clad gangers and a Wargames Foundry TV crew to use in the 7TV2e game. They're just about finished. In 2016 I played just three games that appeared as batreps on my blog. One was for 7TV2e and the other two were for Zombicide. That was pitiful! Now, with just two months of the year gone, I have played four JDMG scenarios that have featured on my blog. I didn't make any New Year's resolutions but if I had I would certainly have expressed a desire to do more batreps on my blog. This, I have achieved... easily! Best of all, I have loads more planned. My enthusiasm for Judge Dredd is as high as ever. There will definitely be at least one JDMG batrep appearing next month - my biggest one yet as all seven of the Judges who have appeared and survived in my previous batreps work together to take out a very dangerous and powerful gang of perps. Who knows, it could be a two-parter depending on how things turn out. The components for the Rum and Bones: Second Tide boardgame. I was very pleased to receive my Wave 1 parcel of the Rum and Bones: Second Tide boardgame with miniatures from Cool Mini Or Not earlier this month. This is more than just an expansion to the original set. The rules have undergone a few changes, not many, but enough to make this a very different game to the original. The biggest change is to do with the character cards, which are drastically different to the original ones. Heroes can now buy their skills and/or upgrade them during the course of the game. I like this new rule but the downside is that until the upgrade cards for the original forces are released in Wave 2, I can only play this new version with the two forces that come in this boxed set. The following info and pictures were taken directly from the Kickstarter page but give you a good overview of the game. 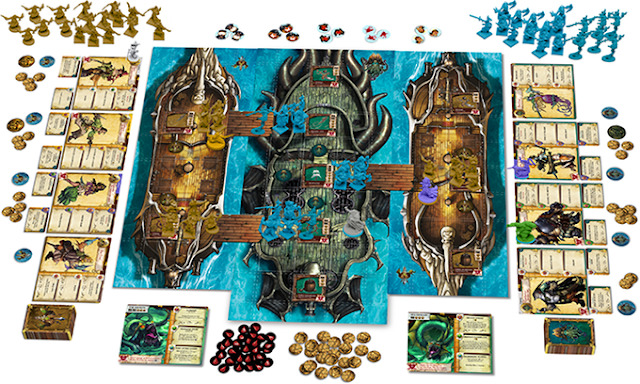 "In Rum and Bones: Second Tide, 2 to 6 players will take control of one of two deadly pirate crews: the mysterious and monstrous Deep Lords, who seek to claim Davy Jones’ treasure in an effort to flood the world and reshape it to their liking, or the Marea de la Muerte¸ a crew of ruthless gold-seeking Spanish cut-throats who will stop at nothing to claim the treasure for their own greed! The Deep Lords seek the power of the locker, and with it, to flood the world! The crew of Marea de la Muerta are motivated by power and greed! In addition to your Heroes, your team will also control your ships' Deckhands and Bosuns, which collectively make up the ships' "Crew". The Crew make up the "background" characters of the fight, much like you'd see in traditional pirate movies - they follow a simple A.I. and path - so it'll be up to your Heroes to do most of the game-changing plays and moves. But don't think they're useless, however, many Hero abilities and effects manipulate your Crew (notably Quartermasters) and can turn these unsung sailors into a truly game-winning force to be reckoned with! Second Tide is no mere expansion, however, there have been numerous upgrades and changes made to enhance gameplay and your pirate experience! The most notable of such is our new dynamic Levelling System! Each Hero has its own unique Dashboard, where its Coin, Damage, and Skills will be tracked. Each Hero begins the game with their Basic Attack skill card. As they gain Coins, which are obtained from KO'ing enemies and Objectives, they can use those Coins to buy new skills, as well as level up existing skills! Each Hero has a set of three Skill Cards, which display their unique powers and abilities. Each skill flips over to reveal its Level 2 version. 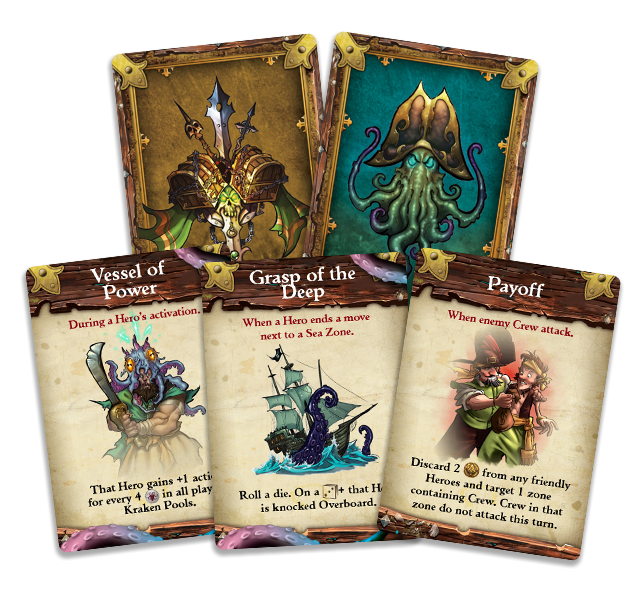 In addition to the Heroes and Crew, however, each faction has access to their own Tide Deck -a deck of 30 cards, 20 of which are unique to that Crew, featuring faction-specific powers and effects. These Tide Cards can turn the Tide (Yarg!) of battle at a moment's notice - but be warned! Utilizing this power can draw the ire of The Kraken, and if it appears it can spell doom for your entire Crew! Slay him, however, and you'll gain the full might of his power, and come all the closer to total victory over your opponent! Each Crew has their own unique, 30 card, Tide Deck! Each Crew has their own unique, 30 card, Tide Deck! But that's not all! To round out all the changes listed above, we've also introduced a new Alternating Activation method of play! With this new system players will take turns activating 1 Hero (or their Crew), and then their opponent will do the same, continuing back and forth until everyone has gone. With this method you can better react to your opponent's actions, as well as change your own strategies on the fly! This new system is sure to create some dynamic and memorable moments as the balance of the fight sways back and forth-just like the Tide!" A game in progress with the two smaller Marea de la Muerte ships flanking the larger Deep Lords galleon. 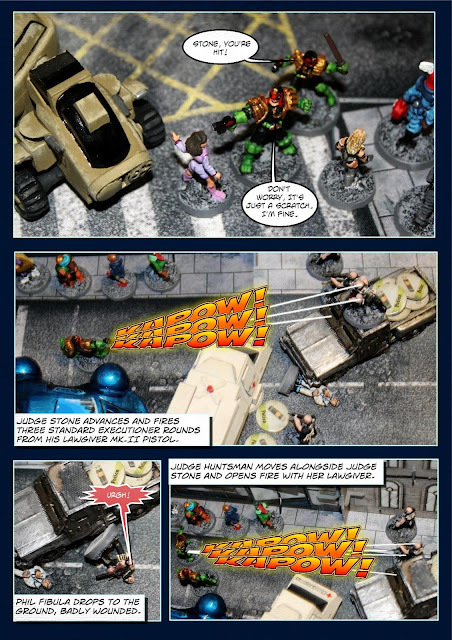 This fourth instalment of my Judge Dredd Miniatures Game utilises two new rules from the game - Melee Combat and Mobs. Surprisingly in my three previous games, Melee Combat never cropped up. 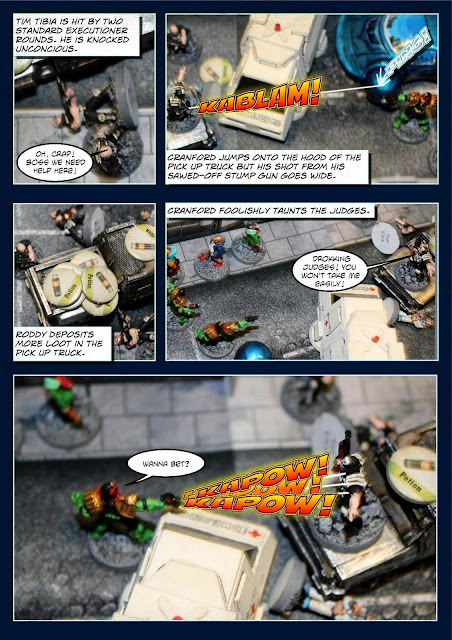 This scenario introduces another two new Judges from Sector 13 - Street Judges Gilbert and Hillers. It is also notable for the first appearance of Zombie Mistress Malexica, who will be a recurring villain of my campaign and a growing threat to Mega City One. This scenario is the One Night in Mega City One standard scenario found on page 24 of the Blood on the Streets supplement, with one extra Special Rule added. Street Judge Gilbert - Level:1 Infantry Hero with 0 Experience Points and worth 175 Credits. Equipment - Boot Knife, Daystick, 2x Lawgiver Mk II Pistols, Stumm Gas Grenades and Standard Issue Armour. Talents - Luck of Grud and Dual Shooter. Street Judge Hillers - Level:1 Infantry Hero with 0 Experience Points and worth 150 Credits. Stats - Move 5", Agility +1, Shoot +3, Melee +1, Melee Dice 2D, Will +2, Armour +5, Hits 2. Talents - Skilled and Deadly and Leg Shot. Malexica - Level:7 Zombie Mistress Infantry Hero with 25 Experience Points and worth 270 Credits. Stats - Psi Points 15, Move 6", Agility +1(+3*), Shoot +0, Melee +1, Melee Dice 3D, Will +4, Armour +0(+2*), Hits 9. Talents - Animate the Dead, Brave, Concentrated Mind, Danger Sense, Foresight*, Shroud of the Dead, Silent Action, Stealthy and The Power Within. Special Rules - Inner Strength, Psychic Conduit, Rise my Beauties! and There Can Only Be One. 3 Mobs of 5 Unarmoured Zombies - Level:0 Illegal Infantry Minions with 0 Experience Points and worth 15 Credits each for a total of 75 Credits per Mob. Stats - Move 3", Agility -2, Shoot N/A, Melee +1, Melee Dice 1D, Will N/A, Armour N/A, Hits N/A. Special Rules - Dead Flesh and Mindless. The Justice Department force was worth 325 Credits, whilst the Zombie force was worth 495 Credits. Yet again, the Judges were outscored but this has never mattered in the past. Would it be different this time? The game was fought on a neoprene gaming mat measuring 2' by 2' that came with my Mars Attacks game. Because the scenario in the rulebook was written to be played on a 3' by 3' game board I reduced all set up measurements by a third. 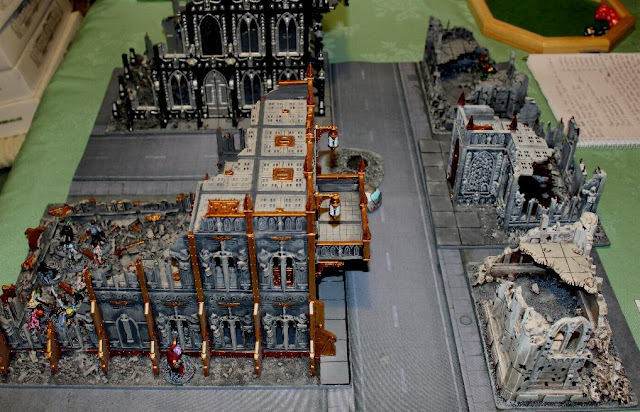 The buildings are all part of my Warhammer 40,000 scenery collection. The crashed silver car was produced by Studio Miniatures and the crater by Ziterdes. The forces are set up in diagonally opposite corners of the board with each zone measuring 8" along the two long sides and 4" along the four shorter edges. I rolled a die for both forces with the Judges rolling a 10 and the Zombies rolling a 4. Whoever rolled lowest were placed first. 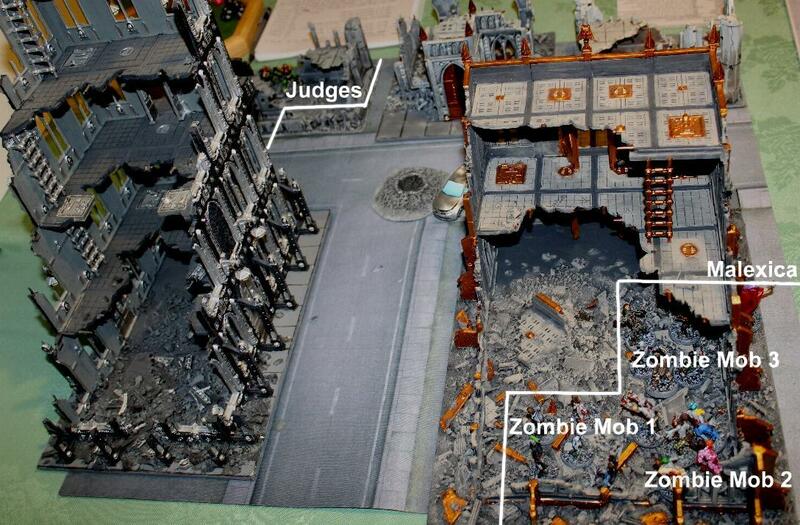 I chose the large grey and bronze ruined building for the deployment of the Zombie force. Both sides rolled one die each again to determine who went first with the highest roll taking the first activation of the game. 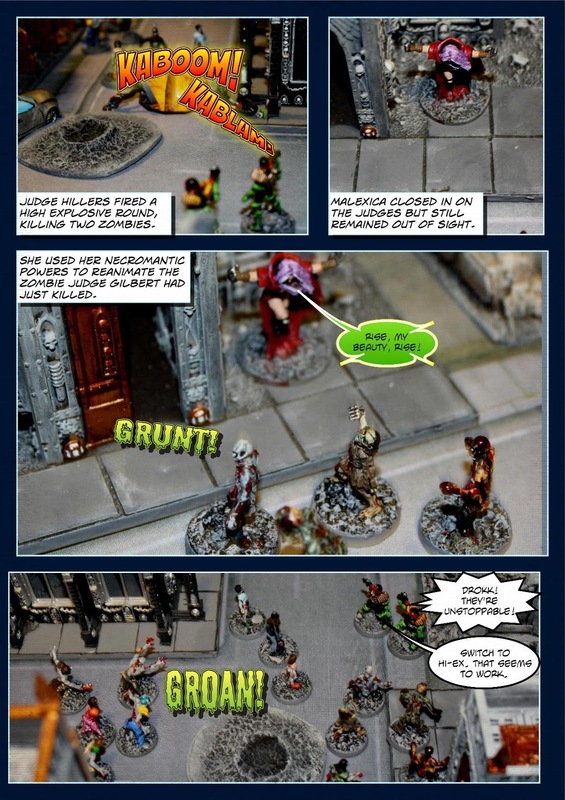 The Judges rolled a 2 and the Zombies a 6, so Malexica and her Zombie Mobs would activate first. Because this scenario takes place at night, no model can make any kind of attack against an enemy more than 12" away. In addition, any model using Talents from the Sneaky Does It tree may re-roll its opposed Will check if desired. This certainly applied to Malexica, who had a few Talents from that tree. I added the following rule - if both Judges are reduced to 0 Hits they are captured by Malexica and taken away to her secret Undercity base, where they will be transformed into Armoured Super Zombies, providing that Malexica has not been reduced to 0 Hits and that she still has enough Zombies left to form a single Mob (in this case, 5 models) to carry the Judges. Otherwise, the Judges return to their Sector House as normal. The fight continues until all the models in one of the forces have been removed from the table, either through injury or failure of a Will to Fight test. The remaining force is the victor. So, for the first time in my campaign, the Justice Department suffered a crushing defeat. Judges Gilbert and Hillers were never seen alive again. Malexica had been experimenting on creating Super Zombies. These two Judges would be the first of her Armoured Super Zombies. +1 for slaying 1 Level:1 Hero. This earned her 2 Experience Points, taking her up to 27, which was not enough to advance to Level:8. She was 2 Points short of the target required. What a great game that was! Where to begin? Let me start with why the Judges fared so badly. Quite simply it was all down to some bad dice rolling for them. Using Hi-Ex rounds against Zombies was entirely the right tactic. Killing Zombies works differently to killing or disabling other models. First of all, Zombies do not have any Hits, so they can absorb a lot of damage. To kill a Zombie, an attacker must roll one D10 and add the damage of the weapon to this roll. On a result of 10+, the Zombie is removed as a casualty. Hi-Ex rounds do 3 Hits of damage, which is doubled against Zombies because of its explosive effects. So the Judges were getting a +6 bonus to their rolls to kill. Sadly, I rolled a lot of low numbers for their damage results, so they struggled to whittle down the Mobs. That was just bad luck - it can happen to anyone. I was hoping they'd wipe out most, if not all of the zombies before they tackled Malexica. Together, they could have defeated her. But one on one, with her at full strength, it was no surprise she defeated Judge Gilbert so easily. When the Zombie Mob attacked Judge Hillers, they were rolling 9 dice to hit and they scored a couple of critical hits (a natural roll of 10), meaning Hillers had to roll a 10 on her 2 dice just to tie with them. She didn't and down she went. Regarding the Comic Life program, I am learning a lot more about what it can do, and I'm loving it more and more. One of the things I learned was how to transfer fonts from one template to another. My comic strips are based on the Sc-Fi template. 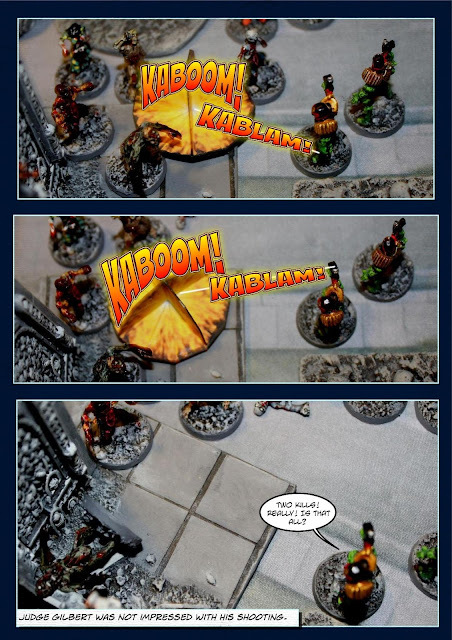 I opened the Zombies template and created the sound effects - Groan!, Grargh!, Grunt! and Glurgh! - using the Zombie font. Then I simply cut and pasted them to my comic strip as needed. Very easy to do but so effective. I also experimented with a number of ways to show Malexica using her Psi Powers. In the end I opted for her green spiky speech bubbles to show her use of psionics. Although not properly explained, when Malexica used her Psychic Boost on page 2, what she was actually using was the Psi Talent, Foresight. This granted her a +2 bonus to her Agility and Armour stats for the rest of the game. I also darkened all of my photos by 25% to indicate that this battle took place at night. I could have gone darker but it looked too dark when I went up to 40% or higher. There is a lot of work involved in creating these comic style batreps but I thoroughly enjoy doing them and I have a lot more scenarios planned. Malexica will return. I'm not sure when but when the time is right she'll be back. I haven't decided what my next scenario will be but I fancy doing a big battle that features all seven of my Judges I have used in the first three episodes. I hope you enjoyed reading this as much as I enjoyed playing and producing it. I continue my reviews of Mercenaries who can be used in the Judge Dredd Miniatures Game. Of the three that I am showing here, only Rico Dredd has appeared in the Judge Dredd stories in 2000AD comic. The other two are characters I have created to use in my current campaign. All three were produced by Warlord Games. At the far left is Rico Dredd, the clone brother of Judge Joseph Dredd, which is to say they were both cloned from the same genetic source, in their case Chief Judge Fargo. Rico was a superb Judge - he came top of his class in 2079, narrowly beating Joe, who came second. However, Rico had a bad streak in him that caused him to fall from grace. He got involved in criminal activities, including extortion, assault and racketeering. When Joe witnessed Rico murder an innocent cafe owner who had refused to pay him protection money, Joe arrested him. Rico resisted arrest by opening fire, but the shots went wide. Given Rico's skill with a firearm, Joe would later posit the theory that Rico was trying to commit suicide by cop out of a deep disgust at what he had become, rather than trying to kill him. Whatever his motive, Rico was sentenced to twenty years hard labour on the prison colony of Titan, the largest moon of Saturn, where he grew to hate his brother. He was particularly angry that Joe didn't testify in his favour. After serving his time on Titan, Rico returned to Mega City One seeking revenge on Joe. Confronting him at his home, Rico challenged him to a duel to settle their differences, knowing that with his superior skills he could always outdraw his brother. However he had grown used to the weaker gravity of Titan after his twenty years there. This slowed him down by a split second and allowed Joe to shoot him dead. Carrying his brother's lifeless body out into the street, Joe declined a paramedic's offer of assistance, allowing the writer, Pat Mills, to conclude the story with a line from the Hollies song, "he ain't heavy - he's my brother!" Long after Rico's death, Joe would be haunted by his memory and Rico appeared to him in a number of flashbacks. In JDMG, Rico is a powerful Level:9 Infantry Hero equipped with Bionic Lungs and armed with a Cursed Earth Eagle Pistol. His following 10 Talents are - Academy Star, Accurate, Close Combat Shooter, Crackshot, Crippling Fire, Dirty Fighting, Leg Shot, Pistol Whip, Rapid Fire and Situational Awareness. He costs 345 Credits. It is unlikely that I will use Rico in my campaign but I may well use the figure as another former Titan inmate with the same stats. In the centre of this group is Willi Braun, aka the Sector 13 Slasher. Warlord Games sold him as a Juve with Club, but I decided to upgrade him to a Punk and make him a named character. Braun is a psychopath who murders his victims with a Las-Knife. He is a loner, but as a Punk Mercenary, he could be hired by a number of forces. I made him a Level:3 Punk Infantry Hero. His only weapon is his Las-Knife and he carries no other equipment or armour. His four Talents are - Skilled and Deadly, Smack-down, Stealthy and This is my Las-Knife. He costs 125 Credits. I thought the figure was far too good to relegate to generic Juve status, even though that is what Warlord Games marketed him as. At the far right is Oleg "Ollie" Zhirkov, an East Meg Agent and Spy. East Meg Agents are highly motivated individuals, exceptionally well-trained, who will stop at nothing to complete their assigned missions. Be it assassination, sabotage or espionage, there is no one better than a good agent. Ollie is a Level:3 Illegal Infantry Hero, armed with a Knife and Handgun Pistol. I gave him the following four Talents - Accurate, Silent Action, Silent Killer and Stealthy. He also has the following Special Rule - Super Secret Agent Man, which grants him the Infiltrator Talent for free. He costs 145 Credits. One thing that bothers me about this figure is the waistcoat he is wearing has the hammer and sickle logo of Russia on its back. Would an East Meg Spy really wear that if working undercover? Or perhaps it is a double bluff? 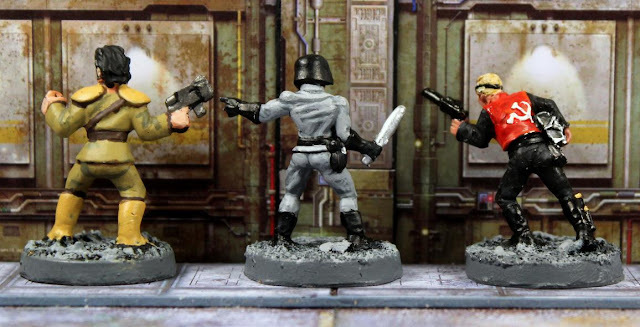 Here are three more mercenary figures from the Judge Dredd Miniatures Game. All of them were produced by Warlord Games and all of them have featured in the Judge Dredd comic series. Fergee was first introduced in prog 100 of the 2000AD comic in the epic The Day the Law Died story. A resident of the Undercity, he proclaimed himself to be "King of the Big Smelly" (the Ohio River). He became a hero of Mega City One when he joined forces with Judge Dredd to defeat the mad tyrant, Chief Judge Cal. He proved fearless, even when capturing a patrol-wagon or going up against Kleggs in hand-to-hand combat. Dredd appointed him honorary Judge status. Fergee enjoyed his new position and took his responsibilities more seriously than even Dredd could have dared hope during the final battle to depose Cal. Despite two bullet wounds in his chest, when the mad Chief Judge tried to press the fatal button which would gas the entire city, Fergee charged into him and carried him off the top of the Statue of Judgement. He fell to his death along with Cal, but Judge Dredd ensured that Fergee's sacrifice would always be remembered in Mega-City One by erecting commemorative statues of him all over the city. His catchphrase and battle cry was, "Easy the Ferg!" In JDMG, Fergee is a Level:4 Infantry Hero armed with a Large Club. He has the following five Talents - Below the Belt, Brave, Careless Charge, Dirty Fighting and Thundering Charge. He costs 155 Credits. Kenny Who? was a comic artist from CalHab (Scotland), who was arrested by Dredd for assaulting comics editors who programmed a robot to imitate his style, without paying him. He first appeared in a 1986 story written as a satire on the then policy of British comics of not paying royalties to artists and writers. After this policy was ended, he appeared in two comedy sequels. In his final appearance, he created a trashzine hero called The Hoolie who fought the corrupt Judges led by Judge Dread; unable to find a publisher, he turned to self-publishing and the trashzine became a massive hit. This led to him being arrested for defamation of the Judges and defended in an appeal by Public Defender 314; his conviction was overturned on technicalities, and he returned home to CalHab in triumph. The question mark was part of his surname, which was a running joke each time someone asked him what his name was, when people would become confused and rephrase the question. In JDMG, Kenny is a Level:1 Infantry Hero armed with an Axe. His two starting Talents are Careless Charge and Dirty Fighting. He costs 80 Credits. Far and away the deadliest of this trio is Stan Lee, also known as Deathfist. Lee is an expert in martial arts, hailing from the Radlands of Ji in China and trained by the outlaw Fighting Heart Kwoon, and a deadly assassin. 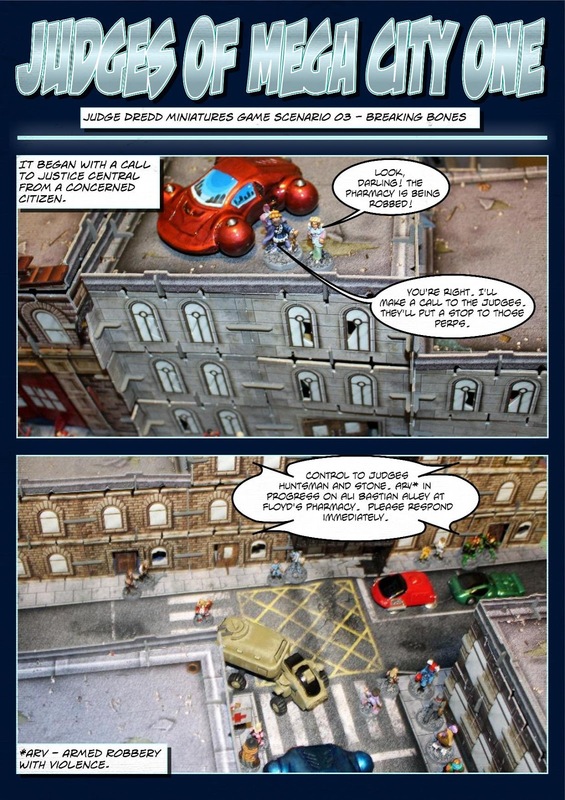 One of the very few people to ever defeat Dredd in single combat, (on his first encounter he easily left him lying unconscious on the street) Dredd has since defeated him twice. He was given a life sentence for murder. Some time later, a female assassin from the same Order named Wu Wang attacked Dredd for the honour of their Order. In the Shimura story The Harder They Come, it was revealed that Shimura had faced Lee back when he was a Judge-Cadet; all the senior Judges present were killed as were the civilians they were guarding, and Shimura was badly wounded and given his distinctive facial scaring by the assassin. In 2127, Lee escaped - deliberately injuring Judge Giant in the process - thanks to the Fighting Heart Kwoon. The Radlands were under threat by the Taoka Corporation's terraforming of the area back into habitable land; Lee was made leader of a group composed of the best warriors of the Radland factions and sent to Hondo to assassinate Amber Taoka. His group were wiped out and he was defeated in a rematch against Shimura, who cut off his left hand: "Deathfist? Better find yourself a new name." Lee also has a daughter called Yin Mie, introduced in Tempest: Time Zero. She arrived in Mega-City One with the intention of freeing her father and, using their mutual abilities, destroying the universe via a time rip in the Undercity. Lee, meanwhile, had used his imprisonment to meditate and learn to use the force known as "black chi", which gave him supernatural powers and a reformed arm at the cost of making him far more depraved. However, the supervillain Tempest managed to push him into the time rip, sending him back to the dawn of time - in anger, Lee struck out and caused the Big Bang utterly annihilating him, but causing the creation of the universe. Lee shares his last name with martial artist/actor Bruce Lee, and his full name with Marvel comic author and editor Stan Lee. In JDMG Stan Lee is a formidable Level:12 Infantry Hero with the following array of Talents - Agile, Black Belt Martial Artist, Brave, Call Me Master, Combat Awareness, Dance of Death, Duck and Weave, Infiltrator, Light Foot, Martial Artist, Silent Action, Silent Killer and Stealthy. He costs 370 Credits. All three figures are decent sculpts but I'm not sure if any of them will appear in my campaign. Maybe I could give them different names and find a use for them. I dunno. 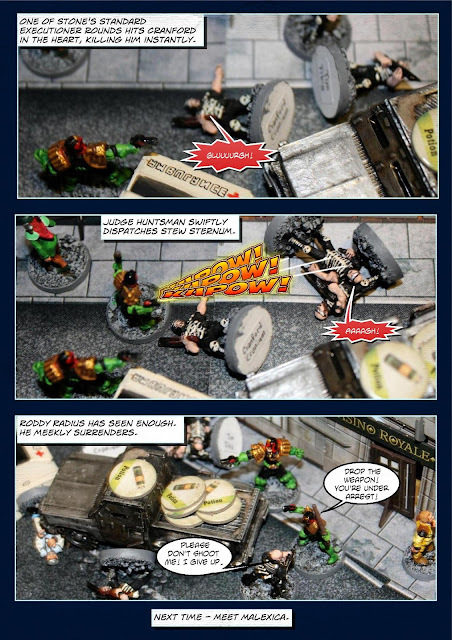 The third instalment of my Judge Dredd Miniatures Game campaign introduces two new Judges to Sector 13 - Street Judge Huntsman and Street Judge Stone. Nikki Huntsman is a female Judge I created. I wanted a female Judge in my force as well as someone who was skilled in the use of the Daystick. Her figure is a Warlord Games figure who was originally going to be Judge Hillers. Hillers has a replacement figure now. The figure of Judge Stone is also a Warlord Games Judge and he is based on my good friend, Dave Stone, from Wargames Terrain Workshop. This scenario is a slightly modified version of the Heist Mobster scenario found on page 50 of the Blood on the Streets supplement. Street Judge Huntsman - Level:1 Infantry Hero with 0 Experience Points and worth 150 Credits. Stats - Move 5", Agility +2, Shoot +1, Melee +2, Melee Dice 2D, Will +1, Armour +5, Hits 2. Talents - Skilled and Deadly and This is my Daystick. Street Judge Stone - Level:1 Infantry Hero with 0 Experience Points and worth 150 Credits. Stats - Move 5", Agility +1, Shoot +2, Melee +1, Melee Dice 2D, Will +2, Armour +5, Hits 2. Talents - Warning Shot and Armour Buster. Cranford Cranium - Level:2 Punk Infantry Hero with 3 Experience Points and worth 120 Credits. Stats - Move 5", Agility +1, Shoot +1, Melee +1, Melee Dice 2D, Will +0, Armour +4, Hits 3. Talents - Brave, Drokk the Law! and Medic. Phil Fibula - Level:1 Punk Infantry Hero with 1 Experience Point and worth 105 Credits. Stats - Move 5", Agility +0, Shoot +3, Melee +0, Melee Dice 2D, Will +0, Armour +3, Hits 2. Equipment - Long Rifle with Rifle Scope and Leather Armour. Talents - Accurate and Crackshot. Tim Tibia - Level:0 Punk Infantry Minion with 0 Experience Points and worth 35 Credits. Equipment - Stump Gun Rifle and Leather Armour. Roddy Radius and Stew Sternum - Level:0 Punk Infantry Minions with 0 Experience Points and worth 35 Credits each. Equipment - Handgun Pistols and Leather Armour. Pick-up Truck - Medium Ground Vehicle worth 80 Credits. Stats - Move 8", Agility -2, Ramming Dice 3D, Front Armour +6, Side Armour +6, Rear Armour +5, Hits 8. The Judges force came out at 300 Credits, whilst the Bad Bones force appeared to be stronger with a total of 410 Credits. But as we have seen in the past, quality nearly always beats quantity. The battle was fought on a board measuring 4 feet by 2 feet using gaming mats, buildings and scenery items from my Battle Systems Urban Apocalypse City sets. The vehicles are just some of my collection of resin cast sci-fi vehicles from various manufacturers. The one exception is my hover ambulance, which I scratch-built from mounting card and plastic bases. Please note the size of the blue and red Lamborarri 2000 vehicles that I recently purchased from Dave Stone. They are much bigger than I was expecting but they fit in perfectly in Mega City One. I'll post a proper review of them soon. I wanted the streets to look crowded so I populated them with lots of my 28mm scale sci-fi civilian figures. The Bad Bones street gang set up within 6" of the centre of the board. They were the attackers and would activate first. 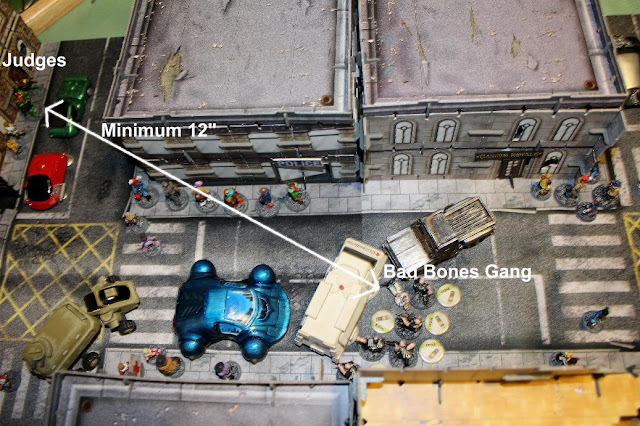 The Judges were allowed to set up anywhere on the board that was at least 12" away from the Bad Bones. I placed them in the upper left corner next to the green car. Every member of the Bad Bones street gang is carrying stolen medical supplies at the start of the game. Each is given one Potion Counter (taken from my Shadows of Brimstone game) to represent this. If a model is killed or driven off, the Potion Counter is dropped at the model's last position. Another Bad Bones member may pick the counter up simply by moving into contact with it, but every additional Potion Counter will reduce his Move score by 1". Potion Counters may be dropped off in the Pick-up Truck, which counts as a Special Action. The Pick-up Truck is not affected by how many it may carry. A model may take a Special Action to grab additional Potion Counters from the hover ambulance. If the Bad Bones can get 5 or more Potion Counters off any board edge, they will claim victory. Cranford Cranium took a fatal hit to the body and died instantly. Phil Fibula was shot in the left leg and crippled (-1 to Move and Agility stats). Stew Sternum was injured in his body (-1 to Agility and Melee stats), whilst Tim Tibia took an injury to the head (-1 to Shoot stat). Roddy Radius was arrested but successfully escaped after one game. Both Judges performed well enough to advance to Level:2. This earned her 4 Experience Points, enough to raise her to Level:3. However, if you remember, a Hero can only advance one Level per game, so Judge Huntsman became a Level:2 Hero with 3 Experience Points. The remaining point is lost. She added +1 to her Shoot stat, to give her a score of +2 and added +1 to her Hits, bringing them up to 3. She acquired a new Talent from the Up Close and Personal list - Feint, which forces an opponent to use one less Parry than he normally has - if he only has one Parry (be it from his weapon or a Talent), he may not Parry at all. Her Credits score increased by +25 to 175. +2 for slaying 1 Level:2 Hero. This earned him 4 Experience Points, but as explained above, only raised him to Level:2 with 3 Experience Points. He added +1 to his Agility stat, to give him a score of +2 and added +1 to his Hits, bringing them up to 3. He acquired a new Talent from the Lawgiver Expertise list - Pour It On, which allows him to roll 4 Shooting Dice instead of 3 when he uses Standard Executioner rounds with his Lawgiver Pistol. His Credits score increased by +25 to 175. His wound was healed very quickly. Another great, fun game, that went pretty much how I expected it to. I was hoping at least one gang member would make an escape attempt in the Pick-up Truck so that I could try out the Vehicle rules, but it never happened. 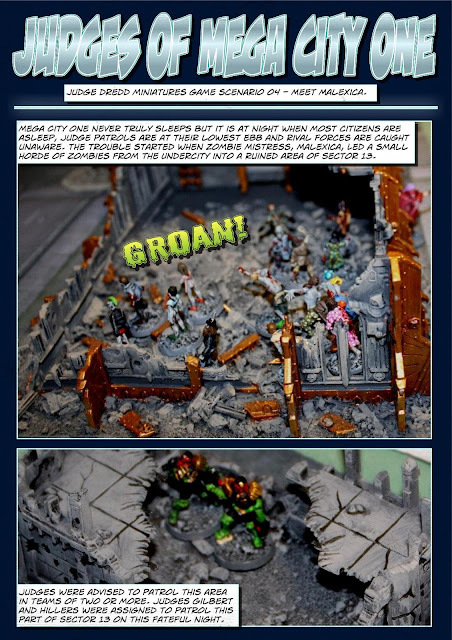 The Battle Systems city buildings and gaming mats, along with the vehicles and civilian figures all contributed greatly to the look of Mega City One. Judges Huntsman and Stone worked well together. So far in the three games I have played, the Judges appear to have had it easy. That all changes next time when I introduce Malexica the Zombie Mistress. Look out for it soon. Last time I reviewed Sabbat the Zombie Master and Malexica the Zombie Mistress. Now I'm going to review the first of my Mega City One zombies. The six zombie civilians shown below were produced by Mantic Games as part of their 28mm scale plastic multi-part Zombie Horde boxed set for the Kings of War game and were gifted to me by Paul Smith. He told me he had some spare Warlord Games Zombie Conversion Packs for sale, which I bought from him. Imagine my surprise when he also included these six figures you see directly below, all made but not painted. All six feature parts taken from the Zombie Conversion Pack (heads, one body and arm, elbow pads, knee pads and shoulder pads). Some of these figures have been slightly converted by me but for the most part they are exactly as Paul made them. None of them were based. I glued them to 25mm diameter MDF bases and added sand and gravel for texture. For the male zombie at the far left I bulked out his shirt covering his chest and back with a small strip of Milliput. I then added a few bullet holes to the shirt. I decided to make the next zombie in line a female. She had the metal body and left arm that was part of the Zombie Conversion Pack to replace her plastic parts. I lengthened her hair with Milliput and also bulked out her dress so that it looked like it was one long dress. The zombie third from the left is also a female. She was originally naked from the waist up, so I added Milliput to hide the fact that she was originally a male and to lengthen her dress. For some inexplicable reason she is wearing a respirator. She really doesn't need it as zombies are immune to gas attacks. For the remaining three zombies I did almost no conversion work and just left them the way that they were when I received them. The two zombies second and third from the right appear to be part of a military force, most likely City Defence soldiers from different blocks. For the zombie second from the right I noticed that he had a huge gaping hole in his stomach, so I added some intestines spilling out of the hole from thin sausages of Milliput. The zombie at the far right is very colourful. He is wearing goggles. All six are really good sculpts. Paul did a great job in making them. I just slightly improved them. They were a huge amount fun to paint. I still have enough pieces left from the Zombie Conversion Packs to make a lot more Mega City One zombies. Moving on, we come to my zombie Judges. 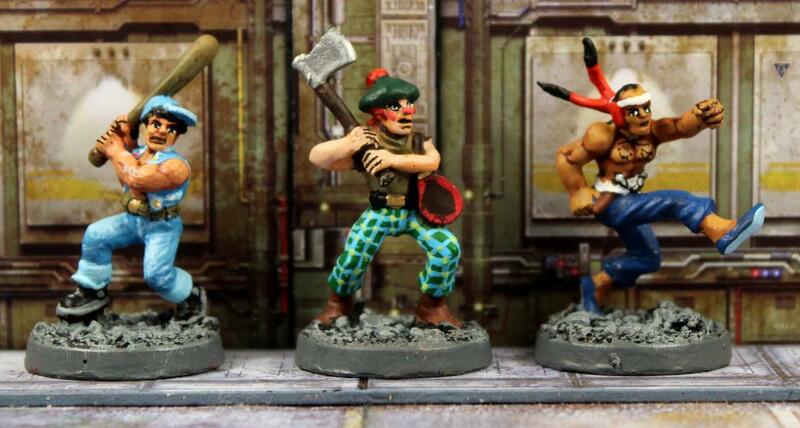 All four of these were produced by Warlord Games. The one at the far left is the unconverted figure they sold. What I particularly liked about this figure was the fact that his right arm was a separate piece. 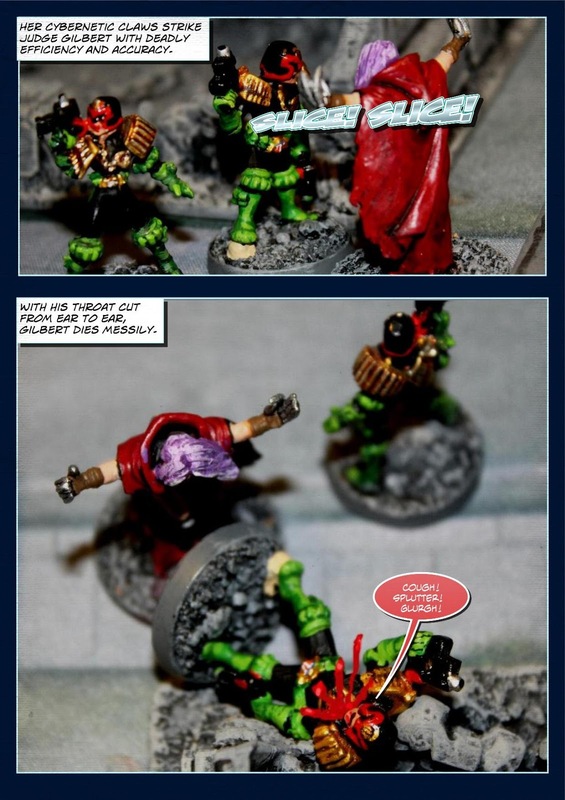 This meant I could position it in a variety of ways for my conversions. For the zombie second from the left I glued the right arm so it hung down his side with his hand just touching his knee-pad. To make him appear different to the original, I sculpted his eagle shoulder pad out of Milliput. With the zombie second from the right I glued his right arm in a position that was halfway between the other two. I then added his uniform sleeve and elbow pad out of Milliput. I thought about sculpting on his right glove but in the end I decided he'd look better without it. So I ended up with three very different versions of the same figure - result! The zombie Judge at the far right is a conversion that I came up. It utilises the upper body of a Judge rider of a Lawmaster bike (his arms are outstretched to grip the handlebars) and a set of legs taken from a foot Judge I had converted. His upper body was used to make another Lawmaster bike rider. I drilled and pinned the upper body to the lower body, positioning it slightly too far to the left. This was deliberate as I wanted to leave a slight gap where the right side of his upper body should be. I filled in that gap with Milliput to represent a gaping wound that exposed some of his ribs. I also drilled a few bullet wounds into his upper legs and lower back. It wasn't an easy conversion but neither was it too difficult for me. I am more than happy with the result. 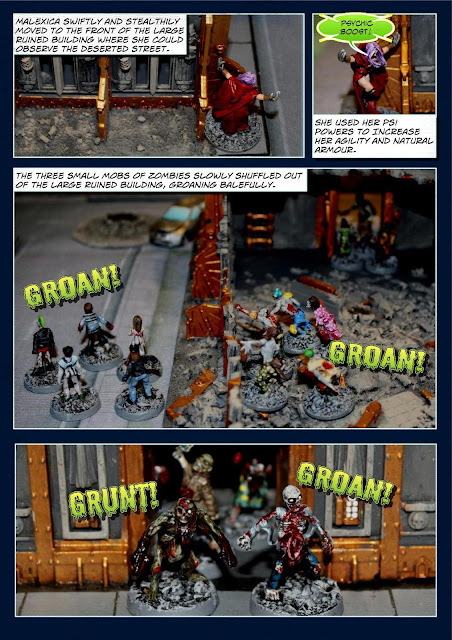 Zombies in the Judge Dredd Miniatures Game come in four different varieties - Unarmoured Zombie (costs 15 Credits), Armoured Zombie (costs 25 Credits), Unarmoured Super Zombie (costs 30 Credits) and Armoured Super Zombie (costs 40 Credits). All are classed as Level:0 Illegal Infantry Minions. Both normal zombies and super zombies have only four stats. Normal zombies have Move 3", Agility -2, Melee +1 and Melee Dice 1D. Super Zombies have improved stats of Move 5", Agility +1, Melee +1 and Melee Dice 2D. The six zombie civilians shown above are clearly unarmoured but the four zombie Judges would certainly count as armoured zombies. All zombies have the following two Special Rules - Dead Flesh. It is hard to destroy a zombie. Whenever a zombie or super zombie is by an attack (or damaged by any other source) roll one die and add the Damage being dealt. 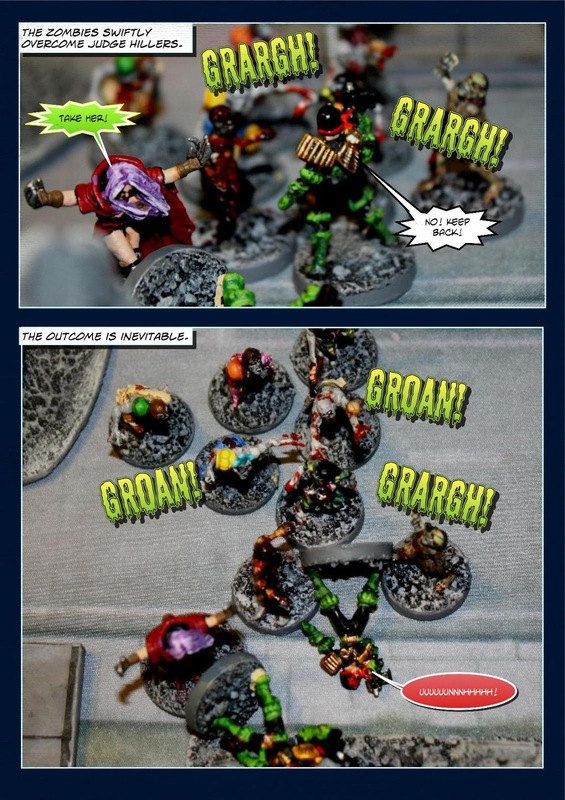 Deduct -1 if the zombie is armoured (zombies do not use the normal armour rules). On a 10 or more, the zombie is removed as a casualty. Weapons that use the Blast, Explosive or Smasher special rules double the Damage being added to this dice roll. Zombies will ignore all Gas weapons. If a zombie is rammed by a vehicle, roll the vehicle's Ramming Dice as normal, but total their results. If this total is 10 or more, remove the zombie as a casualty. In addition, a zombie is fairly easy to patch up after a battle, gaining +1 bonus to the Injured Minions roll. Secondly, all zombies are Mindless. They automatically pass all Will checks and cannot be arrested. However, they can never become Heroes, no matter how many battles they survive. If a zombie is trying to Spot an enemy using the Stealthy Does It Talents, it will only succeed on a natural roll of 10, or if it is a super zombie, on a natural roll of 9 or 10. 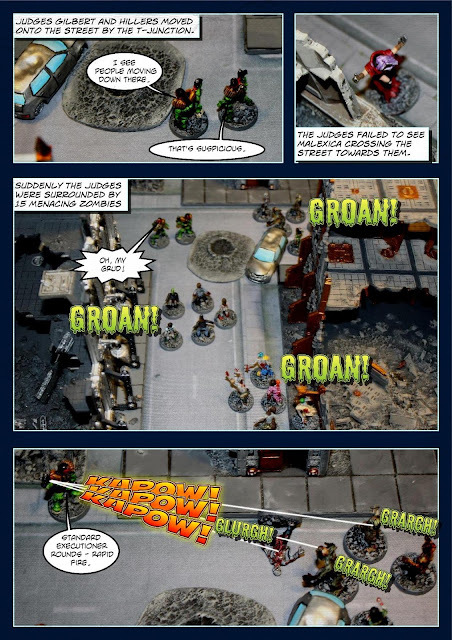 These past few months I have almost solely concentrated on my Judge Dredd Miniatures Game campaign. Despite my blog being called Vampifan's World of the Undead not all of my posts are undead related. Judge Dredd would appear to fall outside of the undead category. But not so. The undead element often crops up in the Judge Dredd comic series. Ghosts, vampires and zombies have all appeared, along with such supernatural entities as demons and werewolves. I have very definite plans for including the undead in my JDMG campaign. One of the most powerful villains to ever appear in the Judge Dredd series was Sabbat the Necromagus (Zombie Master). Arriving from the year 2178, Sabbat reanimated the dead across the entire world, sparking the Fourth World War. Several Mega Cities were completely overrun, prompting the remainder to nuke them out of existence, killing billions. Set mainly in 2114 it featured in the Judgement Day story, which was published in 1992. 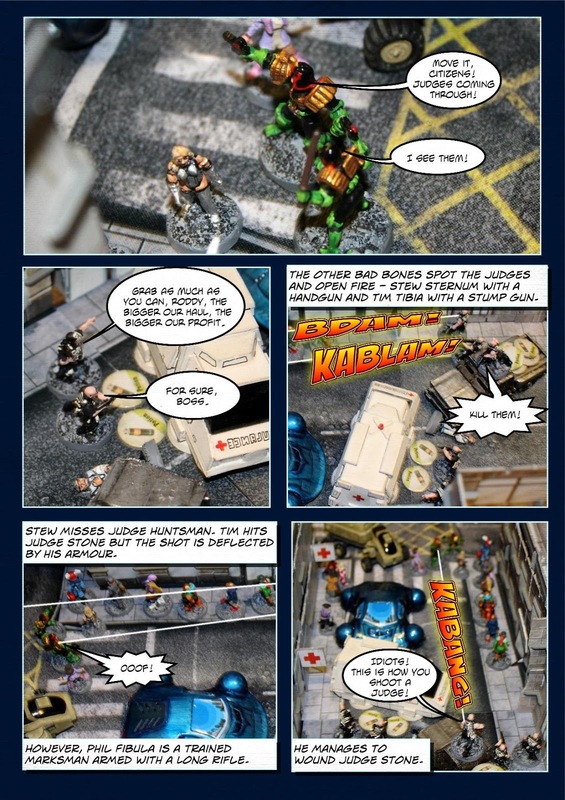 The series is mainly notable because it was writer Garth Ennis' longest Dredd story, because it killed off most of the supporting cast of the Judge Dredd series, and because it was the first story to feature Johnny Alpha since he was killed off at the end of the Strontium Dog series (from Alpha's point of view it was set two years before his death). After a lengthy fight, Dredd and Alpha eventually managed to decapitate Sabbat, and left him helpless, powerless, but still alive (although a story published three months later revealed he had lost his mind and was reduced to a drooling vegetable). At the moment of Sabbat's defeat, his zombies instantly "switched off" and collapsed all over the world at the eleventh hour. Sabbat was, by far, the most powerful zombie master to have ever walked the planet. This is reflected in his stats in the JDMG rulebook, where he is listed as a Level:22 Infantry Hero costing 700 Credits. This makes him more powerful than Judge Dredd - a Level:20 Infantry Hero worth 625 Credits. He has 23 Talents - Animate the Dead, Brave, Concentrated Mind, Critical Reserves, Danger Sense, Daze, Demoralise, Die Hard, Die Harder, Heart Rip, Heroic Rush, Inspire, Luck of Grud x2, Martial Artist, Mental Sting, Mind Shield, Nerves of Steel, Parry, Resist Flames, Shroud of the Dead, Slippery and The Power Within. His Psi Score is 38. He has three Special Rules - Zombie Master - he is the Zombie Master and uses the Psychic Conduit and Rise, Rise my Beauties! Special Rules from the Zombie Hordes section. Second is Natural Talent, which when using the Animate the Dead Psi Talent, allows him to animate all eligible models within range. Thirdly, is Sabbat's Cloak. Animated by the spirits of the those he has pulled from the afterlife, Sabbat's Cloak constantly chides him but also counts as Leather Armour and grants him the Situational Awareness Talent. The figure of Sabbat was produced by Warlord Games and I must admit I am not a big fan of the sculpt. It is okay, I suppose, but I much prefer the Zombie Mistress figure. I have two figures of Zombie Mistress Malexica. The foot figure was produced by Warlord Games and the bike riding version was sculpted by Dave Stone for Wargames Terrain Workshop. I love both versions. I was quite surprised to see just how closely Dave's version matched the foot figure and the "skeleton" bike is inspired. I removed the very tiny slottatab from the foot figure and bulked out the bottom of her cloak with Milliput so that I could more easily glue her to a 30mm diameter MDF base (she is a very tall figure due to her floating in mid air). The mounted version was glued to a 25mm by 70mm MDF base with rounded corners. I should point out that Malexica is not a character from the official Judge Dredd series but is entirely my own creation. I plan on making her the chief villain of my JDMG campaign. She was originally called Millicent Carr, a resident of Mega City One. Upon reaching puberty, her psychic powers emanated. She tried hard to keep them hidden but eventually her secret was revealed and she fled home just before the Judges arrived to take her away. Shunned by society she retreated to the Undercity beneath Sector 13, where my campaign is based. There, she discovered the true nature of her power, and unleashed psychic control of the dead, animating them into shuffling zombies. Now she will have her revenge on the city that has spurned her. At present, she is a Level:7 Infantry Hero with 15 Psi Points. She has 8 Talents - Animate the Dead, Brave, Concentrated Mind, Danger Sense, Foresight, Shroud of the Dead, Silent Action, Stealthy and the Power Within. She is armed with Cybernetic Blades on her fingers, which count as a Knife worth 25 Credits. She is worth 270 Credits. 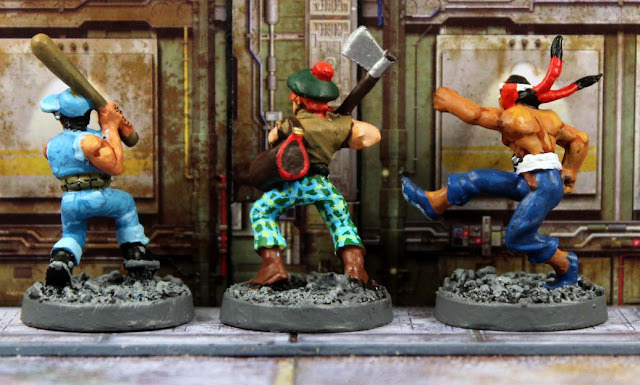 When I posted my first review of my Mega City One Fatties, I mentioned that I was splitting them into three categories - lightweights, medium-weights and heavyweights. Having shown you my lightweights first it is now time to move onto the big boys and the massive boys. My four middleweight Fatties are from various sources. At the far left is another one of the Citadel Fatties that were made for the old Judge Dredd Role-Playing Game produced by Games Workshop. I reviewed these figures earlier. See here - http://vampifansworldoftheundead.blogspot.co.uk/2017/01/jdmg-mc1-fatties-01.html I bulked his body out with a lot with Milliput modelling putty. His shoulder pads came from an old plastic Citadel Space Ork boxed set and fitted the figure very well. The two Fatties in the centre were sculpted by me. For both of them I used a Subutteo plastic football for their bodies and added Milliput to it. 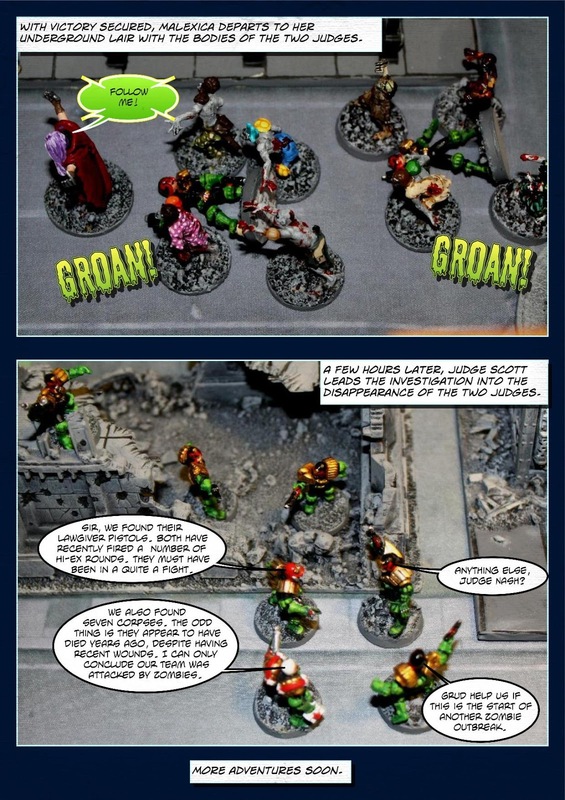 The one with the slogan reading "Drokk art, let's bounce" was based on one of the cardboard cut-out characters that came with the Judge Dredd Role-Playing Game starter boxed set. The one in the green suit is an original design of mine. Their heads are a bit on the large size but I'm reasonably happy with them. The Fattie at the far right is simply a DC Heroclix figure of Bouncing Boy with the addition of a belly wheel that I sculpted out of Milliput. This was a very simple conversion. I even kept his colour scheme untouched and I only painted extra detail to his hands and face. Funnily enough, his body most closely resembles a giant football, more so than my two conversions. Now I move on to the true heavyweight Fatties, with each one weighing (in real life) well over one ton and possibly as much as two tons! Who remembers the Judge Dredd story featuring champion Fattie, Two Ton Tony Tubbs? 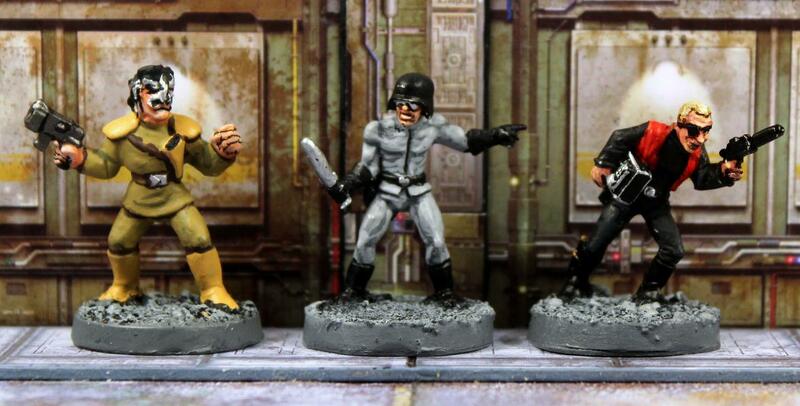 All three were made by Warlord Games for the Judge Dredd Miniatures Game. The two at either end were recent purchases and they came in seven parts not including their bases. Their bodies were a one-piece casting made of resin. Their arms, legs, head and belly wheel were made of metal. The bodies, legs and belly wheels are identical but their arms and heads are different. They came with 40mm square plastic slottabases, which I replaced with 40mm diameter MDF bases. They are about 42mm tall, which some of you may feel is simply too tall. Their height does not bother me at all. I think they are fantastic sculpts. The Fattie in the centre of the group was purchased almost as soon as he was released and he differs from the other two in a few ways. The most notable difference is that he is made entirely out of metal. His body came in two halves and was hollowed out to cut down on weight and on metal. His upper body is a very different design to the other two. By the way, the LF logo on his top stands for League of Fatties. The slogan on his placard, "Make pies, not war" is a pun on the phrase, "Make peace, not war". In the JDMG, Fatties have three special rules, First is Belly Wheel, which I covered in part 01 of my Fatties reviews. Second is Fat! A Fattie may be purchased armour but double all costs. A Fattie may never use a Jetpack, Bat Glider, Power Board, Sucker Gun or Chameleon Suit. They are just too big! A Fattie can ride in a vehicle and will count as a single Crew or Passenger if the vehicle model has been suitably modified/converted. Otherwise, a Fattie may not ride in a vehicle unless there is a suitable place on the model for them to sit (such as the flatbed of a Sloth Cargo Hauler - and no, they cannot sit on the roof!). Fatties cannot use ladders at all, and may only use elevators and grav chutes that are physically large enough for the model. Finally, Fatties are immune to knock-downs. Thirdly, they have my personal favourite, Bacon Butty! If a Fattie has at least 3 Hits remaining and performs two Special actions in a turn it will stuff its face with as much food as it can. The Fattie will then regain 1 Hit. This may not be used to increase its Hits beyond its starting score.